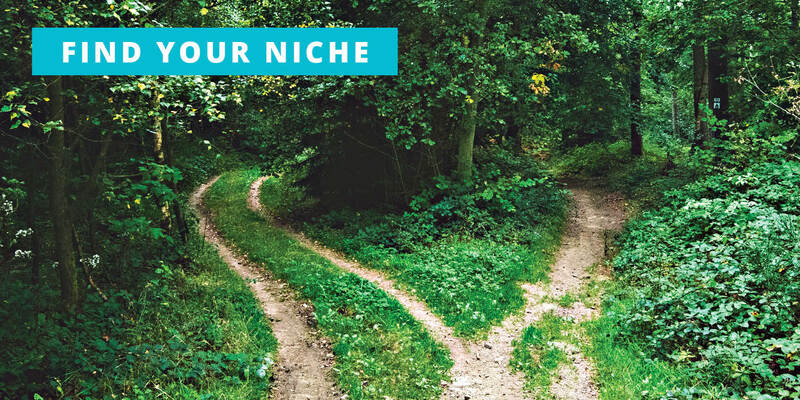 IF you’re currently trying to start a small business, you’ve probably heard about niches and niche marketing. What is all of this fuss about, and what is niche marketing? A niche is a focused, smaller section of a bigger market. If you have a certain niche, you are a specialist providing a product or service that focuses on the needs of specific types of clients. These needs cannot, or are not, addressed in such intricate detail by mainstream providers. If you are in the mood for a mouth-watering, savory cheeseburger, you’re probably not going to go to a place that mainly serves breakfast food. Sure, they may also have cheeseburgers and other such options on their menu, but their specialty focuses on breakfast, waffles, and eggs. You’d be better off going to a burger joint or fast-food place. People are more likely to buy their services and products from a specialist, rather than from a generalist. If you try to be an “expert” in everything, you will be wasting your time, resources, and effort. People are for more likely to go to a specialist, than an obvious generalist. If a person is looking for a healthier food for their dog, they (probably) not going to head over to the grocery store. Instead, they’re going to go to a place like Petsmart or Petco. Why? Because these places specialize in pet supplies. If you really want some new candles and body wash in the same scent – and to have plenty of options available to you – you’re not as likely to go to Wal*Mart as you are a place like Bath & Body Works. Why? Because Bath & Body Works specializes in things like that. Need to work on your house? Are you remodeling your kitchen? You’re probably going to head to a place like Home Depot or Lowe’s, because they specialize in home improvement. Both Wal*Mart and Target sell clothing, but one is more focused on offering bargain prices, while the other focuses on providing quality products. Sure, things like SEO, social media, and paid advertising are helpful when it comes to generating sales and website traffic. You’d be hard-pressed to find something that outperforms email marketing, though. Optimization and Tweeting are great for bringing in that traffic, but it’s the email marketing that gets the conversations. As a business owner, you want to appeal to your niche. You want to continue to bring in sales, rather than just be a one-hit-wonder within the business world. However, you can’t build a successful online business without an email list. According to Statista, the number of active email users throughout the world is expected to reach 2.8 billion by the end of 2016. By keeping up with the latest email marketing trends, and building your email list, will make all the difference in your sales. Not only do emails last longer than social media updates, but you can also target specific readers and clients. By niching down, you are able to send information to the people who will actually want to read what you have to say. This will drive results. Sending out irrelevant emails will only result in you turning people away and losing sales opportunities. Using reliable email marketing services, like Sendlane, will take a lot of the hassle and stress out of the process. Let’s say you have a fairly fleshed-out idea for a business, but aren’t quite sure how to niche down within your market. The first step is deciding who your overall customer is – consumers or businesses. For example, if you want to sell weight loss supplements, your target market is consumers. However, if you’re selling office supplies, your target market is businesses. In some cases, you can actually market to both. You cannot be everything to everyone, and trying to do so will only result in burn-out. The more you can narrow your market, the better off your business will be. Niche marketing is the key to success for all types of business owners, including freelance writers working from their home office. Creating a good business niche involves a 5-step process. It may take a bit of time and effort, but it certainly pays off in the end. Make a list: What type of client or customer are you hoping to attract? With whom do you most want to do business? Be as specific as possible, taking note of everything from geographic location to annual income. Hone in: Clarify what exactly you want to offer your target customer. Keep in mind the difference between a market (weight loss) and a niche (weight loss through juicing). From there, get as specific as possible (weight loss through juicing for people on a budget). Create: Now it’s time to produce services or products that would appeal to the target customer within chosen niche. Test: Once you have paired up your service/product with your niche, it’s time to test it out. Give people the chance to buy your products/service. Offer samples, create a blog, give a seminar, or offer an excerpt of your eBook. This initial test should cost hardly anything, if not be entirely free. Sell and Market: Did it pass the test? Do people want more? Implement your idea in full. Start charging for your services and selling your products. Keep track of which products and prices do well, and which do not. Promote and market your business, and remember to keep building up that email list. Having a solid email list will ensure you are bringing in both new and returning customers, since those who have signed up will already find the information and products relevant to them. They already want to give you their business, so give them something worth buying! Niche marketing isn’t set in stone, so it’s important to stay open to client and customer feedback, as well as new opportunities. Keep honing your skills and perfecting your product, and you will end up bringing in more website traffic and customers.